The other day I ordered a bouquet of flowers from an online company, but when they were delivered there was a note in the box to say that ‘due to circumstances beyond their control’ the flowers they delivered weren’t what I ordered. Now, I’m not normally one to kick up a fuss about things or complain to companies, but I was a bit annoyed that they hadn’t even told me what was going on. It turned out okay in the end, but I would have rather waited a few days until they had the right flowers rather than then send out a bouquet that I hadn’t ordered. So, I sent off a quick email to the company explaining that I would have liked to be kept informed of the situation, and didn’t think anything more about it. BUT…guess what! They offered me a free bouquet of flowers to make up for my disappointment! Result! Instead of keeping them I thought I would share the love…who doesn’t like to receive flowers?! And if you don’t, I’m sure you can think of someone who would appreciate them! I LOVE LILIES!!! they are going to be at my wedding.. this bouquet would brighten up my room! Flowers are beautiful and they always make me smile. I think my favorite ones at the moment are cosmos. I love Lilly of the Valley because they look like little bells and they are so delicate. 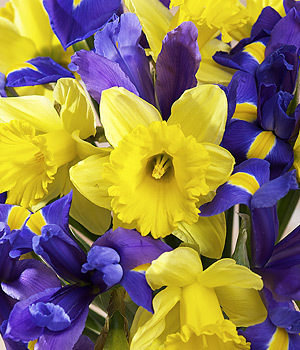 I also love Daffodils because they are so yellow and cheery! 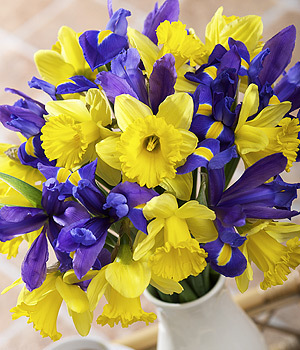 My favourite flowers are …. I don’t have a favourite type… I think they’re all pretty in their own right. I think id give these flowers to my neighbour, she lives on her own and was in A&E this morning cuz she has gaul stones. My favorite flower is the sweetpea as the smell of them is beautiful. If I won I would love to have these on my bedside table so I can wake up to the lovely sight and smell of them. My favourite flowers are sunflowers. My boyfriend had a nightmare on Valentines days trying to find me them (too early and the shops are full of roses :P) until I told him not to bother hehe. I love lilies, I just think they are beautiful! I would probably put the flowers in my bedroom to remind me of spring when I wake up!